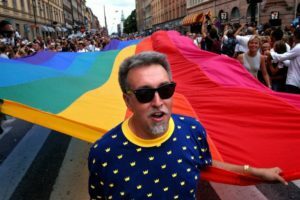 World-famous political activist, designer and flag-maker Gilbert Baker (1951-2017) created the Rainbow Flag in 1978. Over the next four decades, his creation would become embraced across the world as the universal symbol of the lesbian, gay, bisexual, and transgender (LGBT) movement. Gilbert’s work as a vexillographer (flag maker) spanned nearly four decades and includes distinctions for creating two flags that attained world’s records for their length. Baker was born in Kansas in 1951, and suffered while growing up in a conservative state. He was drawn to art and fashion design as a child, which alienated him from peers. He hoped that being drafted into the US Army would be his escape, but he encountered severe homophobia during his time in basic training. When he opted to become a medic, Gilbert was stationed in San Francisco. There he found a home as an openly gay man, thriving in the counterculture movement of the post-Stonewall era. After completing his military service, Gilbert used his artistic talents in his political efforts, creating banners for anti-war and pro-gay marches and protests. At the suggestion of friends and colleagues, including San Francisco supervisor Harvey Milk, Gilbert began work on the creation of a new symbol for the gay and lesbian political movement. He sought to replace the pink triangle, a Nazi relic from World War II. Working with friends, he dyed and sewed the first Rainbow Flags. On June 25, 1978, Gilbert raised the banners in United Nations Plaza to commemorate that year’s San Francisco Gay Freedom Day Parade. The next year, Gilbert found work at Paramount Flag Company in San Francisco, creating flamboyant window displays for the business. His work caught the attention of Mayor Dianne Feinstein, who commissioned him to design flags and banners for her first elected inaugural ceremony. These successes brought Gilbert numerous high-profile commissions from the city, designing flags for distinguished events such as visits by foreign heads of state and dignitaries. The zenith was Gilbert’s creation of flags, banners and bunting for the 1984 Democratic National Convention at San Francisco’s Moscone Center. In early 2018, the Gilbert Baker estate, administered by his sister Ardonna Baker Cook, convened an Advisory Committee to help evaluate and support various programs, events and product endorsements that would properly honor Gilbert’s legacy of LGBT pride, liberty and visibility. In addition to traditional textile work, Baker began creating fine art celebrating the Rainbow Flag and the gay community. This began in 1978 with a series of signed limited-edition silkscreen posters. A second series followed in 1979. He created new Rainbow Flag posters and paintings every year to mark its birth. One of his 1992 silkscreens hung in the Clinton White House. In June of 1994, Gilbert achieved a world’s record when he created a mile-long Rainbow Flag to commemorate the 25th anniversary of the Stonewall Riot 1969 in New York City. The banner measured 30 x 5,280 ft. and was carried by 5,000 people. The project was underwritten by Stadtlander’s Pharmacy. In 2000, Gilbert staged his first exhibition of photographs and fine art celebrating the flag in Rome for World Pride. However, numerous protests from the Vatican delayed the exhibition, and later closed it down. In 2002, the New York Gay LGBT Community Center hosted a 180-piece show of Gilbert’s work. The following year, an expanded version of the show was mounted in two simultaneous exhibitions at the San Francisco Public Library and the San Francisco LGBT Community Center. In 2003, to celebrate the Rainbow Flag’s 25th anniversary, Baker broke his own world record by creating a gigantic flag for Key West Pride. The banner was 1 and one-quarter miles long, and stretched sea to sea from the Gulf of Mexico to the Atlantic Ocean. The flag was cut into sections that were distributed to more than 100 cities around the world. The project was underwritten by Absolut Vodka. The Key West flag was chronicled in the documentary “Rainbow Pride,” directed by Marie Jo Ferron, and screened at film festivals and on public television. Throughout the decade, Gilbert was invited to serve as grand marshal for LGBT pride events in cities around the world. Among the host cities that honored him were Philadelphia, New York City, Toronto, San Francisco, London, Stockholm, Vancouver, and Winnipeg. In 2008, Gilbert returned to San Francisco to work on acclaimed director Gus Van Sant’s movie “Milk,” starring Sean Penn in an Oscar-winning performance as the martyred politician. Gilbert recreated period banners for the film and appeared in a cameo role. That same year, he departed from his signature rainbow imagery to create a series of map paintings in gold bas-relief. In 2011, Gilbert was honored by the National Gallery of Art in Dublin, Ireland, and presented a Rainbow Flag to the country’s president, Mary McAleese. In 2012, Gilbert suffered a severe stroke that affected his physical movement. Despite a pessimistic prognosis by doctors, Gilbert pursued a personal rehabilitation therapy: applying beads and sequins by hand to gowns and outfits. He did this work during the summer of that year in Cherry Grove on Fire Island. In a period of time that surprised experts, Gilbert regained his ability to sew. He was crowned best-dressed at the annual Drag Invasion of the Pines on July 4. The accolades increased. In 2013, Philadelphia named their annual OutProud award for Gilbert. 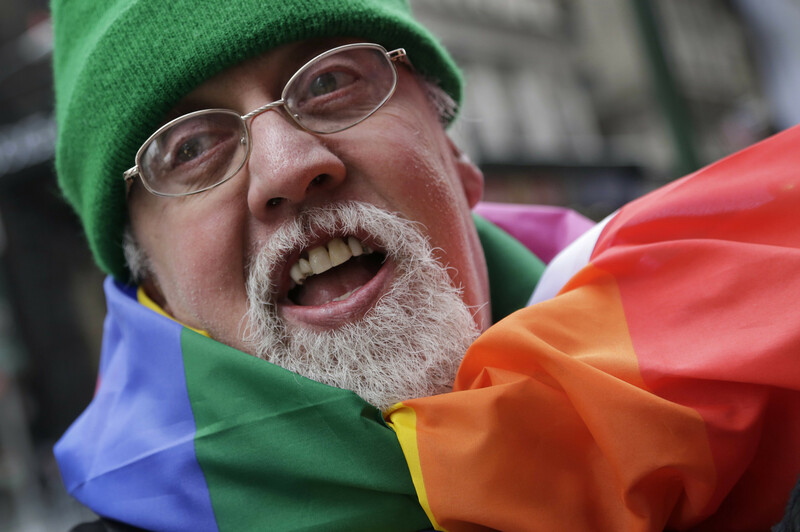 In 2015, San Francisco created the Gilbert Baker Award, now presented annually during pride festivities in June. The same year, Gilbert was asked to contribute a Rainbow Flag to the permanent collection at New York City’s Museum of Modern Art. The unveiling ceremony took place on June 26, the same day that the Supreme Court of the United States legalized gay marriage nationwide. In the hours that followed, rainbow colors illuminated iconic structures globally, including the Sydney Bridge, the Eiffel Tower, Niagara Falls, the Empire State Building, the World Trade Center, Cinderella’s Castle at Walt Disney World, and The White House. 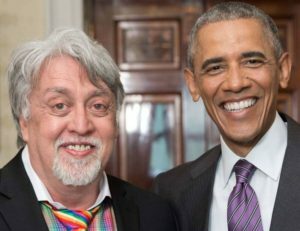 Gilbert Baker & President Obama (photo courtesy of the White House). On June 9, 2016, Gilbert attained a high point in his life of activism. He was invited to the White House for a reception to commemorate LGBT Pride Month. There, he personally presented President Barak Obama with a hand-dyed, cotton Rainbow Flag. Gilbert’s activism was amplified in reaction to the election of President Trump in November 2016. Recognizing the danger that Trump posed to America’s poor and its minorities, especially, the LGBT community, Gilbert created a powerful response: a collection of Holocaust outfits emblazoned with pink triangles, the symbol that identified homosexuals in Nazi concentration camps. These were exhibited at the Art Saves Lives Gallery in a San Francisco in January 2017. On March 31, 2017, Gilbert Baker passed away in his sleep at home. At the time, he had been planning for a trip back to his childhood home in Chanute, Kansas. There, he was to be honored at the first annual Gilbert Baker Film Festival at Labette Community College. Memorial services for Gilbert were held that June in San Francisco and New York City, the latter including a protest march against President Trump. 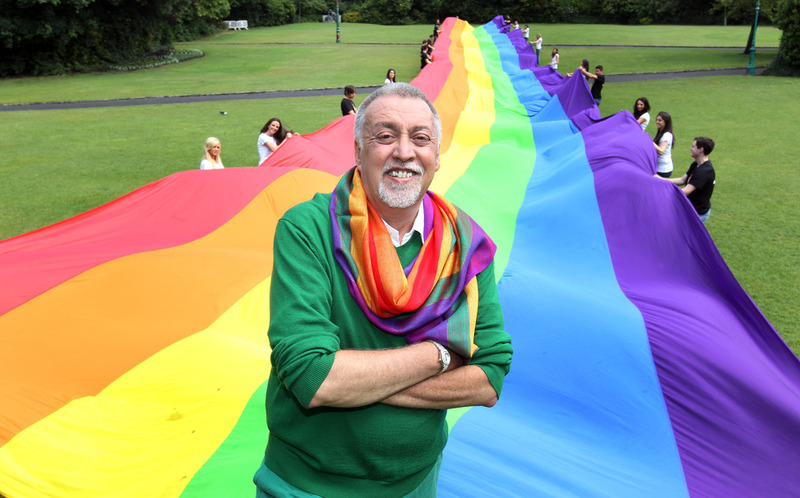 Gilbert Baker’s Rainbow Flag resides in the public domain, as do all flags.